How Auto Sweep Feature Gets Higher Interest on Saving Account? Do you want more Interest rate on your Saving Account? Check how 'Auto Sweep Feature' gives higher interest rate on saving account (equal to fixed deposit interest rate). As you are Saving account holder, you must be know, you hardly getting 3-4 % interest on Saving account. If you want to get higher interest rate of Fixed Deposit on Saving Account then read how you can get higher interest rate with auto sweep feature of saving account. Most of people do Fixed Deposit to get higher returns but the major drawback of Fixed deposit is you need to break your FD in case of emergency fund, and also you need to do lots of paper work with Fixed deposit (Maintain Fixed Deposit Slip, TDS form etc etc). 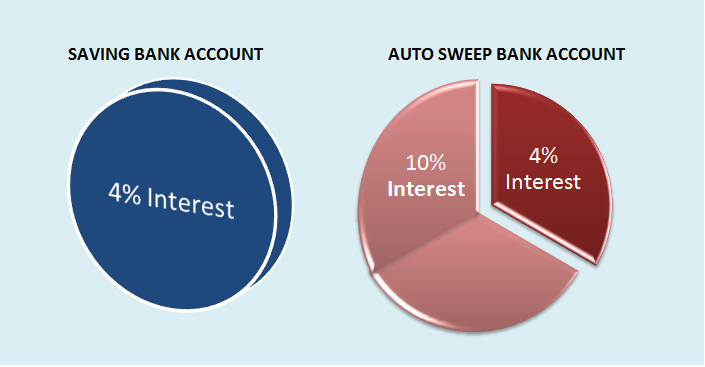 But here we giving you Auto Sweep feature which will give you higher interest rate on normal saving account. 1. You have Rs. 50,000/- in your saving account, out of which you need Rs.20,000/- as your monthly example (i just giving your rough example, don't take it seriously :D). 2. Now the Rs.30,000/- (which left after your monthly spending) will be transferred to Fixed Deposit account and for this Rs.30000/-, you will get higher interest rate ( equal to fixed deposit). 3. In case of emergency, you can always claim back this money, any time. 4. No penalty to be paid, if you withdraw that 30000 prior time / Maturity time. (so, the major drawback of fixed deposit is major advantage here). 5. So, just Set a threshold on your saving account (amount to be deducted in auto sweep feature) and rest of the amount will be swiped to fixed deposit account automatically by your bank. 6. Its Auto renewal Scheme, once you activated, you don't need to renew it, bank will deduct amount from your account every month (you can discontinue anytime). So,this the saving scheme known as Auto Sweep Feature, but have different name in different Banks. Most of nationalist bank have this feature. check below which bank given what name to auto sweep feature. Now you can enjoy more interest on saving account with this feature. Also, this feature will help you to get more savings.